When I was a 21-year-old college student, I was working my way through school in a jewelry store. One night, a new song came on the radio called "Ten Thousand Angels" and I thought it was pure awesomeness. The singer, Mindy McCready, was also 21-years-old, just like me. But unlike me, she wasn't selling charm bracelets to pay for college tuition; she was selling millions of albums. She became engaged to her very own Superman, Dean Cain, while I couldn't catch the eye of the cute boy in my calculus class. She was buying her first Nashville mansion while I was renting a one-bedroom apartment. Unfortunately, what followed that time of talent, fame and money was disappointment, addiction and depression. The downward spiral was too hard for too long, and at 37-years-old, she took her own life. Suicide breaks my heart because it means that someone was living life without hope. 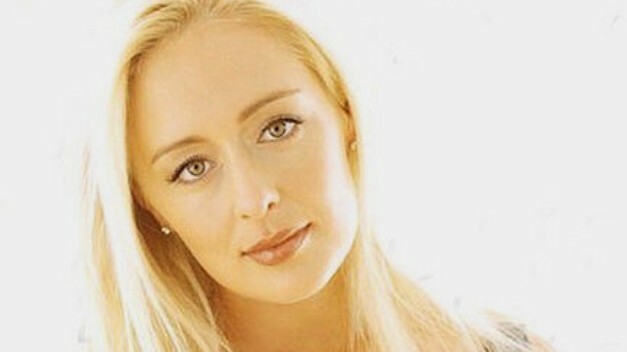 So on Sunday, when I read about Mindy McCready's suicide, I just felt weird. Like when someone dies and we say, "But I just saw him last week", that's how I felt. "But I just listened to her album last week." 1999: Released her third album with disappointing sales and was dropped from her record label. 2004: Arrested for writing false prescriptions for Oxycontin. 2005: While on probation, she was charged with a DUI. 2005: Hospitalized after her boyfriend, Billy McKnight, beat the tar out of her. 2006: Gave birth to her first son by abusive boyfriend, Billy McKnight. 2007: Arrested for battery. Sentenced to 1 year in jail. 2008: Claimed she had a relationship with married Roger Clemens when she was 15 years old. 2008: Sentenced to 60 days in jail for violating parole. January 13, 2013: Boyfriend, David Wilson, committed suicide by a self-inflicted gunshot wound on McCready's front porch. February 6, 2013: Judge committed McCready to in-patient facility for depression and substance abuse at her father's request. Her children were put into foster care. February 8, 2013: Released from the treatment facility because "a mental health provider assessed her and found she didn't need to be here." February 16, 2013: E! obtained McCready's last interview where she talked about how hard it was to lose custody of her sons and how devastated she was over the suicide of her boyfriend. February 17, 2013: Mindy McCready committed suicide by self-inflicted gun shot wound on the same porch where boyfriend committed suicide one month earlier. All those years.... Is there anybody who could have helped her? And if so, would she have let them? Mindy McCready wanted to stop her pain with death, but that's when the real pain started for the survivors - her friends, family, and her sons, who now have to grow up without a mother. Two of my friends can tell you first hand how devastating it is to lose a family member to suicide. I asked them if they would feel comfortable sharing something for this post. Jessica's brother committed suicide. He showed no warning signs; he didn't leave a note. "I'll never lose this feeling, this feeling of losing my brother to suicide. It's a pain that runs deep. If people who were thinking of suicide knew the pain they left behind, maybe they would think twice. I had a friend contact me out of the blue; he was contemplating suicide, and he remembered my reaction to my brother and stopped himself. He couldn't do that to his loved ones. Instead, he contacted me on how to get help. If this blog of Amanda's stops one suicide, I will be happy." Marcia's father, a Vietnam Veteran, committed suicide. He left a note saying that he didn't want to be a burden, but Marcia never felt like he was. You can read the Atlanta Journal and Constitution article here about Marcia's experience and suicide prevention advocacy. "Don't ignore the warning signs. Get involved. You must take care of yourself both physically and mentally." These amazing women know what's like to live as a family survivor of suicide, and now, they both work to help others. I think about Mindy McCready's parents and her two sons, and how their pain is just beginning. If you are thinking about ending your life or if you're worried that someone else is, please get help. A good place to start is the National Suicide Prevention Lifeline and then go from there. 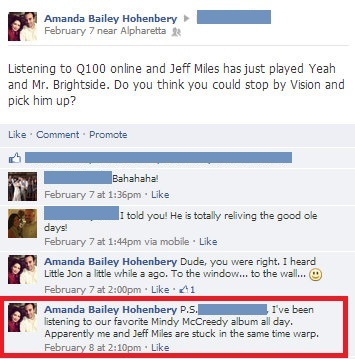 In one of my favorite Mindy McCready songs, she sings, "I wanna be all that I can be, stay true to my heart. I wanna be beautiful, carefree as a little girl. I wanna laugh, I wanna love." It's heartbreaking that she didn't have more time to do just that.